The Senate fiscal committee will consider today a California Chamber of Commerce-supported job creator bill establishing a public-private partnership program to help prepare students at selected schools for high-skilled, high demand jobs in technology, manufacturing, health care and finance. SB 1243 (Portantino; D-La Cañada Flintridge) creates the California State Pathways in Technology (CA P-TECH) program, which can be a useful addition to the strategies to meet the need for skilled workers. CalChamber supports well-designed and rigorous efforts to improve high school completion and post-graduate preparedness. 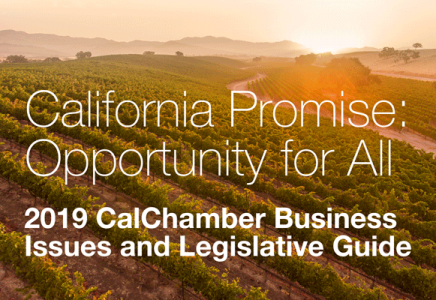 Representing more than 13,000 employers of all sizes and in all industries, CalChamber sees California’s long-term economic growth to be dependent on having a steady stream of highly skilled workers. Job growth in California has been robust since the last recession. Recently, however, that growth has slowed—not because of the business cycle, but for lack of employable workers. Growth of the statewide labor force slowed to a 0.6% pace in 2017, just two-thirds of the average rate since 1990. This has occurred as job openings across skilled and unskilled occupations alike have reached record highs. The projected shortage of skilled workers over the next generation is more than a million college graduates with bachelor’s degrees, as well as hundreds of thousands of workers with two-year associate’s degrees and certificates. The CA P-TECH program will approach the challenge of upgrading high school graduates’ skills by focusing on both strong academic performance and workplace learning—two key elements for successful high school and dual enrollment programs. This preparation naturally leads to students achieving degrees, credentials and certificates that make them employment-ready and desirable to employers. The previous successful experience under the California Career Pathways Trust demonstrates the efficacy of this approach to student success. SB 1243 will be heard in the Senate Appropriations Committee today. CalChamber is urging members to contact their senator and members of the committee and ask them to support SB 1243 as a job creator.